The US Army War College describes the chaotic conditions of a battlefield as VUCA – Volatile, Uncertain, Complex and Ambiguous. These are the factors generals must contend with as they penetrate “the fog of war” to determine their strategy. Corporations face the same turbulent market conditions as they vie for competitive advantage. This demands a high level of situational awareness – the essential starting point for the development of a winning strategy. What kind of mental discipline is involved in creating this kind of situational awareness? The ancient parable of the blind men and the elephant provides some valuable lessons. In ancient times a king ordered all his blind subjects to be assembled and divided into groups. The groups were taken to an elephant and each group was introduced to a different part of the animal. 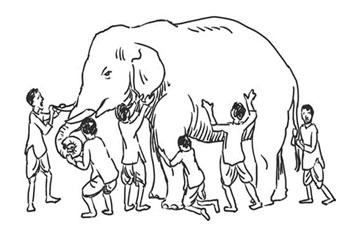 Those who made contact with the head described the elephant as a water pot, those who felt the ears defined it as a fan, those who touched a leg said it was a tree, and those who felt a tusk thought it was a peg. The groups then fell into arguing amongst themselves, each insisting their version was correct and all others were wrong. It was only when they listened to each other and built on each other’s perspectives that they were able to construct the whole picture and “see” the elephant. 1) One kind of blindness is to see only what we want or expect to see and to screen out evidence that does not fit our preconceived notions. Psychologists call this the “confirmation bias.” We all suffer from it to one degree or another. It seems to be part of the human condition, but can lead us seriously astray. For example, in its long march into insolvency General Motors kept blaming its cost disadvantages, while downplaying its quality deficiency versus Toyota – the main cause of its ultimate failure. Xerox committed a similar error when it ignored Canon’s entry into the household copier market. Soon Canon launched a devastating attack on Xerox’s home turf by selling fast machines directly to large companies, thereby toppling Xerox from its leadership position. Both companies simply refused to acknowledge the elephant in the room. Avoiding the confirmation bias requires a disciplined self-awareness plus rigorous tools to enable organizations to confront the brutal truths they must contend with. 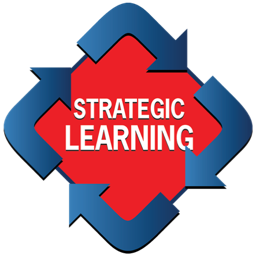 Strategic Learning, the strategy process I have developed, requires that as a first step, organizations should do a Situation Analysis where diverse teams develop penetrating insights into 4 areas of inquiry: industry dynamics, competitors, customers and their own internal realities. This helps to avoid the blind spots and biases that can occur when we think alone. 2) As we strive to understand reality, a crucial factor is the ability to harness synthesis. Analysis – the ability to break things down – is a widespread competence. Synthesis, on the other hand – the ability to connect the dots and recognize patterns – is a rare but crucial capability. For example, the US intelligence services have concluded that the majority of the lapses in security (including the 9/11 tragedy) have been failures to see the whole picture by connecting the separate pieces in the puzzle. They were unable to see the whole elephant. How can we become better at synthesis? I find it helpful to think of synthesis as having two dimensions: a vertical dimension that reveals historical trends and a horizontal dimension that reveals the connections between things. The practical translation of this vertical/horizontal thinking is this: in doing a Situation Analysis, always be sure to map the trends and avoid trying to create an insight from a snapshot. As Winston Churchill remarked, “The further back you look, the further forward you can see.” The trends tell the story. That is the vertical dimension. To reveal the hidden connections and identify patterns, look horizontally. Examine the key insights from the separate areas of inquiry in the Situation Analysis (industry dynamics, customers, competitors, etc.) and deliberately explore them to discover the connections between them. Don’t stop until you have found the integrated story. We don’t have to be a genius like Einstein to create “the beauty of synthesis.” We can use the simple techniques I have described in order to “out-synthesize” our competitors. 3) A critical component of the kind of insights that produce synthesis is curiosity. By this I don’t mean idle curiosity; just being interested in information that happens to come our way. I mean energetic curiosity – the relentless pursuit of penetrating questions that challenge our underlying assumptions and re-examine received wisdom. The first part of the word question is quest. It is noteworthy that everything we know results from a question someone pursued at some point in time. The method for doing a good Situation Analysis is based on these Socratic principles. Each team in the four areas of inquiry is given a set of guiding questions to pursue. As they dig deeper, further questions arise until the answers become clear. It is a process of intense mental engagement. Socrates, as we know, was the great exponent of learning through questions. He believed that great insights are invariably born from great questions. His mother was a midwife and he used to say that his art was the same as that of a midwife. She does not give birth to the child, but facilitates its delivery. One of the great tasks of a leader is to ask searching questions and to teach everyone in the organization to do the same – not “gotcha” questions that shut down discussion, but questions that invite exploration and dialogue. These are our “portals of discovery.” We will never have all the right answers, but we must have the right questions.